The exoplanet discoveries just keep getting better and better. An international team of astronomers, equipped with a gamut of state-of-the-art ground and space telescopes, have stumbled upon the presence of a staggering seven Earth-sized planets orbiting a star 40 light-years away — including three which exhibit a strong chance of possessing water and being habitable to life. The incredible new results, published in Nature on Wednesday, are the most exciting exoplanet discovery since the detection of Proxima b — the closest exoplanet to Earth, orbiting nearby Proxima Centauri at 4.25 light-years away — and raise hopes of finding another planet similar to Earth which could be inhabited by future generations which have mastered interstellar travel, or perhaps already be home to extraterrestrial life. “With the right atmospheric conditions, there could be water on any of these planets,” said Thomas Zurbuchen, associate administrator of the Science Mission Directorate at NASA, at a press conference on Wednesday. “These planets are among the best of all the planets we know to follow up” for study in life-bearing atmospheres and biosignatures. Indeed, the findings are a far cry from just a couple of decades earlier, when astronomers believed there were very few planets outside the solar system, and certainly even smaller odds that there could have been planets with the potential to sustain life. The star system in question is governed by an ultracool dwarf star called TRAPPIST-1, named after the TRAPPIST telescope which found it, located at the European Southern Observatory’s La Silla Observatory in Chile. TRAPPIST-1 is just 8 percent the mass of the sun — hardly bigger than Jupiter — and is comparably quite dim. For that reason, the planets would need to be much closer to the host star in order to stand a chance of developing the kind of temperatures and compositions necessary to sustain life as we know it. Fortunately, as explained by lead study author Michael Gillon, an astronomer at the University of Liege in Belgium, TRAPPIST-1 and its planets retain such a tight configuration. The new findings, made using TRAPPIST, the ESO’s Very Large Telescope (VLT) at Paranal in Chile’s Atacama Desert, and the NASA Spitzer Space Telescope, collectively confirmed the existence of three previously found exoplanets in the system, plus an additional four which had never been observed before. The planets, named TRAPPIST-1b, c, d, e, f, g, and h in order of increasing distance from the star, all have sizes similar to Earth. The key to discovering this exoplanet family has to do with the tried-and-true formula of observing stellar transits: watching the light glowing off a star dim on a regular interval as evidence that an object or series of objects are orbiting it. The TRAPPIST telescope is basically the “little telescope that could” in the world of exoplanet research — it was originally designed as a prototype to test out the technology for a larger project, but has managed to punch way beyond its weight and help lead to a groundbreaking discovery like this one. TRAPPIST was initially used to detect three of the star’s exoplanets last year, but follow-up observations indicated there were four other periodic stellar transits independent of those objects. As surprisingly useful as TRAPPIST is, it has its limits, and that’s why the VLT and Spitzer Space Telescope were also used to better observe the stellar transits in the TRAPPIST-1 system by honing in on more detailed spectral and chemical analysis. The research team was able to use the new data to make more accurate characterizations of the new planets’ sizes, compositions (the innermost six are most likely rocky), and distances from the star. 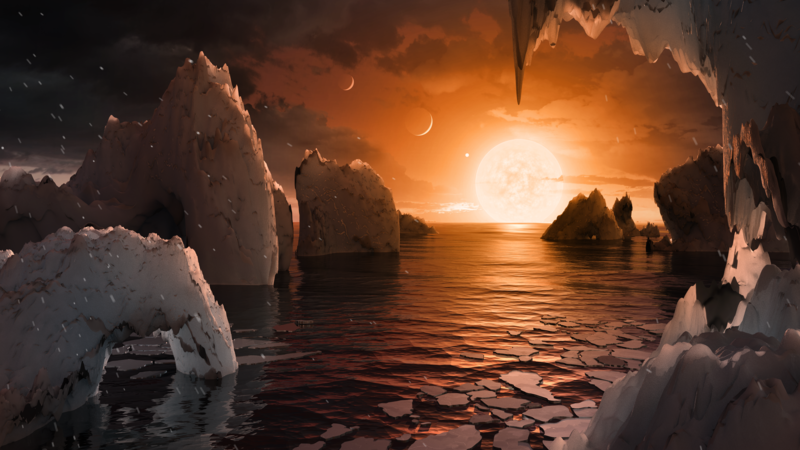 All seven planets might possess water — the single most essential trait to allowing life to thrive on another world — but it’s TRAPPIST-1e, f, and g which are particularly compelling. They reside in the host star’s Goldilocks zone: the original region in which is not too hot or too cold for surface water to pool up. The temperature and climate are just right for life to potentially evolve, or for life from another planet (raise your hands!) to potentially make a home for themselves. The TRAPPIST findings add to the already growing list of over 3,500 confirmed exoplanets, including 44 potentially habitable worlds. However, the biggest impediment to really confirming if any of these planets resemble Earth and could foster life — terrestrial or alien — is the fact that it’s extremely difficult to study the atmospheres of these distant worlds. That could change with the new generation of instruments being constructed right now, like NASA’s James Webb Space Telescope and ESO’s European Extremely Large Telescope. Developing more technology that can pinpoint the present of biosignatures, like methane and oxygen, is critical to the search for habitable planets and extraterrestrial life.